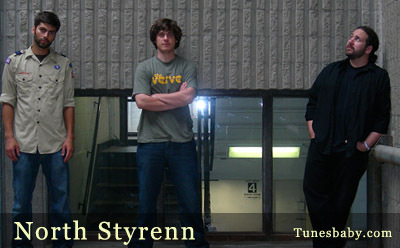 North Styrenn (Pronounced Sti-ren) was formed in 2002 in the twin cities of Minneapolis/St. paul in Minnesota. Drawing inspiration from such classic rock bands as The Who and Pink Floyd and more current bands such as Soundgarden and U2, the members stockpiled original songs and home recordings over the next 2 years. Late 2004 found the band having its first complete line-up. Ryan Pula(Lead vocals, guitar),Victor Johnson(Guitar, backing vocals), Chris Bierden(Bass Guitar,Vocals) and Clint Trotter(Drums). 2005 found the band playing live shows throughout the twin cities and recording tracks for what ended up being The North Styrenn EP. Released in January 2006.7 tracks in all. As Clint points out,'I think the music will stand out to people looking for something real, something that has not been imitated 1000 times'. The band continued to play many shows in early 2006 gaining momentum as a band and receiving good reviews of their newly released CD. Although the band was dealt yet another member change with the departure of Chris Bierden on bass in spring of 2006, North Styrenn continue writing new material for the bands first full length release.